The Co-Cathedral of St. John the Evangelist is a cathedral of the Catholic Church in Rochester, Minnesota, United States. It is the co-cathedral and a parish church of the Diocese of Winona-Rochester. St. John the Evangelist Parish was established by the Rev. James Morris in 1863. It is the oldest Catholic parish in Rochester. At the time of its founding, the property where the parish's buildings continue to stand was acquired. A church was completed in 1872 and dedicated by Bishop Thomas Grace of St. Paul. As the parish grew, a larger church building was completed in 1905. Three schools, a grade school, a girl's high school and a boy's high school opened in 1913. Plans for the present church were completed by New Ulm architect Edward F. Wirtz, and construction began in 1955. Local contractors completed construction two years later. The Modern structure features an exterior composed of Mankato stone and a seating capacity of 1,200. It was extensively renovated from 2001 to 2002. On March 27, 2018, Pope Francis elevated the church to be the co-cathedral of the newly renamed Diocese of Winona-Rochester. The new designation reflects the economic growth of the city of Rochester, and the demographic changes that have occurred since the diocese was founded in 1889. 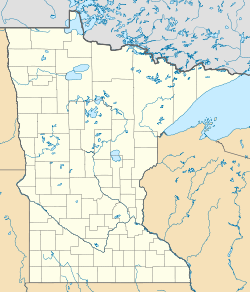 Three-quarters of the diocese’s population now resides between Rochester and Mankato. St. John the Evangelist Church was elevated to cathedral status at a liturgy on June 24, 2018, the Nativity of Saint John the Baptist. ^ a b "History". Catholic Church of St. John the Evangelist. Retrieved 2018-03-27. ^ Matthew Stolle (March 28, 2018). "Rochester church becomes co-cathedral". Rochester: Post-Bulletin. Retrieved 2018-03-29. ^ "St. John the Evangelist Elevated to Co-cathedral". The Courier: Official Newspaper of the Roman Catholic Diocese of Winona-Rochester. July 2018. On Sunday, June 24, 2018, the Solemnity of the Nativity of St. John the Baptist, the Church of St. John the Evangelist in Rochester was elevated to the dignity of a co-cathedral.